It is well known that the population of people whose last name is Spanish is now the largest group of non-Anglo population that Oregon has. The census of 2010 illustrates the new ethnic population growth trends here in Oregon, as well as the United States. This Window is devoted to civic activities local, national and continental. It is basically a glance at what was going on within our neighborhood. Of course now days this means our digital neighborhood which is basically the entire planet. The first phase of this window will center around the early topics that were prevalent just after WW II ended in 1945; topics that relate to migrants, immigrants and the work force in Oregon and especially Marion County. Please read this Introduction to the Civic/Civismo window. Above: The website you are currently viewing was offically launched on October 12th, 2012 (Columbus Day). The event took place in the cafeteria of the Gervais High School, the very school where Miguel Salinas graduated as the first hispanic student to graduate from that school. Miguel's granddaughter was given a camera to take photographic record of the event, and her results are compiled in the slideshow above. I had the pleasure of meeting Mr. Sweetland at a political function in Gladstone, Oregon. I regret not having taken the time to talk with him and learn about his remarkable political life. Mr. Sweetland by that time was legally blind and had to be assisted from place to place. I recall his demeanor and face as a positive first impression. It will be until 10 years later that I would learn of his advocacy for those who did not have a voice. Keep in mind that during his youth, blacks were not allowed to vote and migrant workers had little or no rights. Mr. Sweetland would be the person who would champion English as a 2nd language, Bilingual education and the improvement migrant life in general. 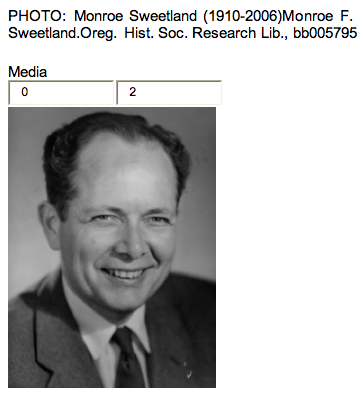 Mr. Sweetland was born in Salem, Oregon in 1910. This date also parallels with the date when the town of Asherton, Texas was incorporated. Many of the children for whom he championed equal rights in Oregon will come from this little town referred to as “Cheto”…Asherton, Texas 2000 miles away! Mr. Monroe Sweetland was a prominent political figure in Oregon, as well as, nationally. He was also engaged in world politics. 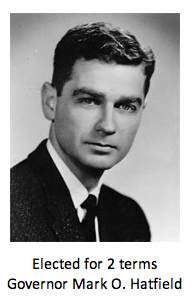 Many other figures will follow and show the sensitivity and understanding of our evolving Oregon Community such as Senator Mark O. Hatfield, Supt. of Public Instruction Mr. Rex Putnam, Supt. of Schools Dale Parnell, and Dr. Ronald Petrie. These four men worked in creating laws, developing programs and supporting unconventional or new educational practices in Oregon. THANKS TO THE LEADERSHIP OF THESE FOUR MEN OUR EDUCATIONAL SYSTEM WILL INCLUDE MORE LEARNING OPPORTUNITIES FOR OUR MIGRANT YOUTH.